More money, more explosive problems? 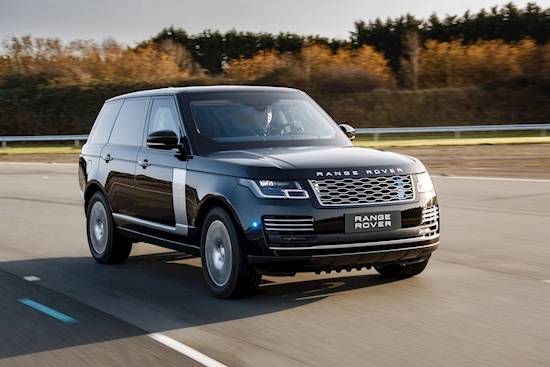 If people want you dead, Land Rover's Special Vehicle Operations (SVO) has your back with a freshly updated version of the armored Range Rover Sentinel which is based on the top-shelf Autobiography model. The upgrade includes armored glass, undercarriage/roof blast protection, and an emergency escape system located in the rear luggage compartment for quick getaways. The luxury SUV made its debut recently at the Home Office Security and Policing Show in Farnborough, U.K., which we imagine is like SEMA for bobbies. Under the hood, a 375-hp 5.0-liter supercharged V-8 engine replaces the previous model's 335-hp V-6, and despite adding more than a (British) ton of armor plate and glass, SVO claims a 0-60 time of 9.8 seconds and a top speed of 120 mph. Not too shabby. It can also ford deep water, although if Range Rover told us how deep, they'd have to kill us. The latest Sentinel is built at the SV Technical Center in Warwickshire, England, and has been engineered to survive unconventional forms of attack, including improvised explosive device (IED) fragmentation blasts. Naturally, the chassis, suspension, stability control, and brakes have all been upgraded to accommodate the heft of the additional security bits, in addition to myriad other types of bullet and blast attacks. Land Rover's secure SUV rolls on a special run-flat wheel system that can be driven up to 30 miles at 50 mph if one of the tires is toast, and the front window lowers just 5.9 inches to allow for document exchanges—no more. There's a public-address system you can use to try to negotiate your way out of sticky situations, twin 10.0-inch touchscreens in back, LED exterior lighting, and available sirens and emergency lighting. If you dress to impress, the optional Black package is the way to go for more black finishes and darker trim. Pricing wasn't announced, but we estimate a starting price of at least $500,000 and up based on previous iterations. Besides, if you have to ask, you don't own oil fields.